It’s been a fun packed half term week storytelling at the Art House Crouch End. 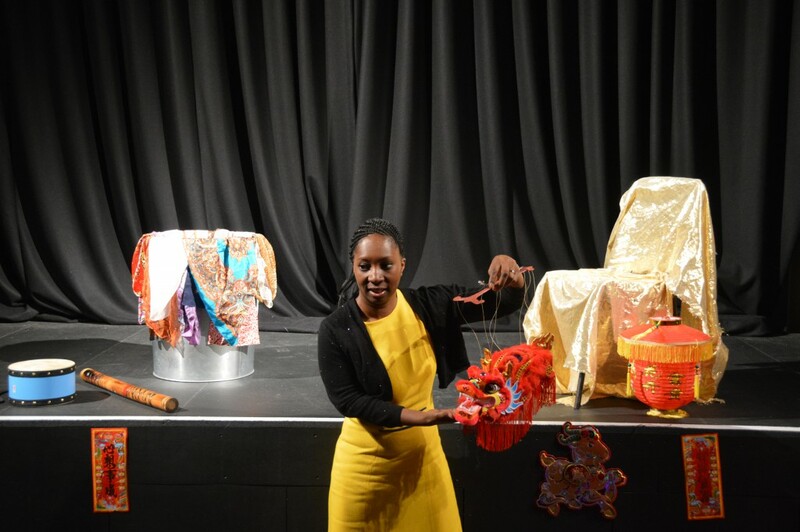 As today is the start of the Chinese New Year, I told a couple of Chinese folktales to a room full of 7 – 10 year olds. To celebrate the Lunar New Year we re-enacted the legend of the sea monster Nian with lots of percussion instruments to make the sounds of fire-crackers. To keep things lively, I showed everyone how to do the Chinese Dragon dance and children were given colourful scarves which they used to make dragon shapes and dance to Dragon music. After telling the tale of the ‘Ma Liang and the Magic Paint Brush‘, everyone drew marvelous pictures of what they would paint if their pictures could come to life with a magic brush. One child drew a ‘doughnut city’ that had a huge doughnut making factory for everyone to eat donuts! Someone else drew their empty school on fire so that no-one would have to go back to school again. There was a lot of cheering for that idea. One of the best parts of this session were the conversations and stories that came about from our fortune cookies. Everyone received a fortune cookie for taking part and we read most of them out together, creating short stories about what the proverbs mean. All in all, a fun morning and a cracking start to the Chinese New Year.